This trip is the perfect combination of relaxation and adventure. For two days, share time onboard the luxurious Rocky Mountaineer train as western Canada’s spectacular mountain ranges pass you by. Once in the Canadian Rockies, get ready for days of exploration and adventure on your choice of guided activities – catered to your abilities and interests. Choose from a selection of our favorite Rockies tours, from hiking, canoeing, to climbing. We’ll ask about your interests and preferred pace, then plan your trip to suit your style. Ever wanted hike across a glacier, or learn to climb a mountainside? We’ve got the best guides to help you give it try. Finish each day with a sense of accomplishment – with incredible photos to show friends back at home! Spend two days traveling onboard the Rocky Mountaineer – the perfect place to relax and. Once in the Rockies, you’ll spend action-packed days together - and create memories to share for a lifetime. Welcome to our hometown - a famously lovely west coast city, surrounded by mountains and ocean. Get out and walk the seawall - or let us arrange a bike. Bypass the crowds and start making the most of your vacation. A friendly driver orients you to the city as you drive in. We've included dinner tonight at one of our favourite restaurants in Vancouver. Overnight at The Loden Hotel. This property is located at the edge of Coal Harbour, downtown Vancouver’s premier luxury neighborhood. The elegant hotel is surrounded by some of Vancouver’s most popular attractions, from museums and galleries to world class shopping and dining options. Indulge in a relaxing spa treatment, or savour gourmet flavours at the bar-bistro if you wish during your stay. Enjoy Vancouver with an activity today. With a mild climate and so much to do, it’s no wonder people flock to this beautiful west coast city! The bike is a Vancouverite's preferred mode of transport. With an extensive cycle lane network, this tour highlights the best of Vancouver food, history, and culture. Visit the Stanley Park seawall, savour a snack at Granville Island Public Market and see historic Gastown and Chinatown. Enjoy an exciting zodiac ride up Indian Arm to Deep Cove, to witness the beautiful, natural fjord leading to Granite Falls. You will have a chance to see Stanley Park, English Bay Beach, Lions Gate Bridge, Coal Harbour, Deep Cove, Twin Islands, Raccoon Island, Buntzen Powerhouse and much more. Shuttle to Horseshoe Bay to enjoy a scenic zodiac tour – keep an eye out for seals, eagles, and other west coast marine wildlife. Enjoy a delicious meal in the small-town atmosphere on Bowen Island. Finish your adventure with a scenic seaplane flight back to Vancouver. All aboard! Settle in while the smell of breakfast wafts from the galley. A small jolt announces you are on your way – a day of spectacular scenery to look forward to. Overnight in a Kamloops hotel. Dress comfortably for the Rocky Mountaineer, with something warm in case you go outside. You might also want to bring something to read or a game. A driver will meet you at your hotel and take you to the Rocky Mountaineer Station. Travel onboard the Rocky Mountaineer train from the coastal city of Vancouver to the heart of British Columbia’s interior. On today’s journey you will see dramatic changes in scenery, from the lush green fields of the Fraser River valley, through forests and winding river canyons surrounded by the peaks of the Coast and Cascade mountains, to the desert-like environment of the interior. Onboard, enjoy assigned seats in a single-level SilverLeaf dome car with oversized windows, offering panoramic views. Enjoy a hot gourmet breakfast and lunch served at your seat, plus complimentary snacks and beverages throughout the day. Enjoy Rocky Mountaineer’s legendary hospitality, as friendly and attentive staff entertain you along the way. After your overnight stay in Kamloops, wake up refreshed and ready for another day of breath-taking beauty. Your journey continues north and east to the Canadian Rockies and the province of Alberta. Once again dramatic scenery will surround you as you follow the banks of the North Thompson River through the Monashee and Cariboo mountains, climbing ever nearer to the high peaks of the Continental Divide. Today’s highlights include Mount Robson, at 3,954 metres (12,972 feet) the highest peak in the Canadian Rockies, Pyramid Falls, and the climb over the Yellowhead Pass into Jasper National Park. Breathe in the cool, fresh mountain air of the Rockies -- you’ve arrived! Overnight at the Sawridge Inn & Conference Centre. Set amidst the breathtaking Canadian Rockies, the Sawridge Inn offers the rustic charm you’d expect in Jasper National Park. The hotel is just a 15-minute walk to the downtown core. Enjoy an on-site spa, decadent dining and heated pool with jacuzzi and steam room. Additional amenities include seasonal bike rentals, complimentary WiFi, and a seasonal outdoor fire pit. Be sure to inquire about the shuttle between the hotel and the town centre. Jasper National Park, the biggest in the Canadian Rockies, is a magical place - and we have lots of ideas to help you enjoy it. Jasper's Bear's Paw Bakery offers delicious homemade stuff - one of our favourite spots! Explore the wildlife, alpine meadows and magnificent views on a privately guided walk/hike - with one of Jasper’s most knowledgeable mountain guides. Venture beyond the town of Jasper and join this hands-on experience that takes you places beyond the beaten path and is fun for the whole family. An evening on a mountain lake is breathtaking – the call of a loon, a beaver gliding though the water, or perhaps a moose grazing on the shore. Paddle with a guide across the lake, in a large canoe for a peaceful way to end your day. Today is an all-day trip down the spine of the Canadian Rockies – on one of the most spectacular roads in the world, with lots to do along the way. Enjoy mouth-watering Rocky Mountain cuisine in the comfortable, warm atmosphere of the Mount Burgess dining room. With a seasonal menu-featuring free-range elk, bison and caribou along with seafood, pasta and delicious desserts, there is something for everyone. From the Icefields heliport, you'll soar over the spectacular Cline Pass at 2900 m (9000 ft.). This heli tour is full of natural beauty, glaciers and waterfalls, including amazing sights you can only see by helicopter. Enjoy a glacier adventure on an ice walk with short stops along the trail. Learn more about active glaciation and understand the features you are seeing. There are constant views of the Canadian Rockies, along with glacially carved landscapes such as moraines, millwells, and crevasses. Overnight at Emerald Lake Lodge. This stunning property is located in the heart of Yoho National Park, famed for its Jade-coloured waters. Built of hand-hewn timber and featuring massive stone fireplaces, the Emerald Lake Lodge includes an in-house dining room, quiet reading and sitting rooms, and a games room. Other hotel amenities include a dry sauna, stainless steel outdoor hot tub and fitness room to enjoy if you wish to do so. Immerse yourself today in the beauty of Yoho National Park. Offering beautiful places to explore such as Field and Emerald Lake. With so many beautiful places to discover in and around Emerald Lake, you will be wondering where to start first. Emerald Lake is one of the most admired destinations in Yoho National Park, with an unmatched diversity of both activities and landscapes suited to the enthusiastic traveler. An hour-long hike around the lake is one of the least strenuous but most rewarding activities in the park. Emerald Lake is a fantastic place to see bald eagles, moose, and ospreys, as are waterfowl such as loons and mergansers. You can also rent canoes and rowboats to take in the beauty from the lake. Feeling a little adventurous? 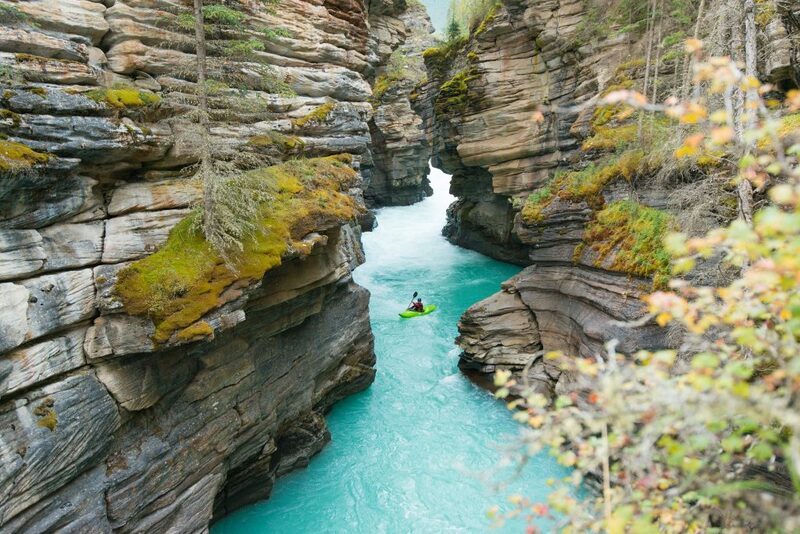 Choose to explore the area with a rafting tour on the Kicking Horse River. Challenge yourself by working with your fellow paddlers to get through up to class 4+ rapids on the mighty Kicking Horse River. Your tour completes 20km downstream with a well-deserved BBQ. Today's a short drive as you make your way to the town of Banff, today is the perfect day to stop in Lake Louise and get your lakeside photo. On the Banff Gondola, soar to the top of Sulphur Mountain for a bird's-eye view of six incredible mountain ranges. Stroll along the ridge-top boardwalk, explore the interpretive centre, and enjoy breathtaking 360-degree views. Banff is like Canada’s playground. Visiting during the summer months gives you a chance to enjoy the crisp mountain air during early morning walks, hike through Banff National Park, stroll up and down Banff Avenue for a little shopping, or enjoy five-star spa treatments at your leisure. In the evening, you can enjoy the beautiful starry sky or dine at some of the best restaurants – the choice is yours. Whether you’re an adrenaline junky or prefer to experience the quieter side of Banff, there are activities for everyone. Overnight at the The Rimrock Resort Hotel. Built into the side of a mountain, The Rimrock sits high above Banff town providing guests with spectacular views of the Bow River Valley. Just a 5 minute walk from Banff Upper Hot Springs and the Banff Gondola, other tourist attractions are only minutes away by car. Hotel amenities include a fitness centre, spa, indoor pool, hot tub, steam room, sauna and multiple on-site dining options. The hotel offers a complimentary Roam Bus pass valid on the transit system, to help you get around town during your stay. Fill your lungs with cool, fresh Rocky Mountain air and head out to explore Banff National Park in your chosen way. Venture into an underground world in this introduction to caving. Spend approximately two hours underground, crawling past prehistoric bones and investigating ancient cave formations. This will be an unforgettable experience. Begin your day with a scenic ride up to a mountainside resort. Take in the spectacular views before a guided walk through Sunshine Meadows. Learn about the wildlife, vegetation and ecosystem of this fascinating world above the treeline. Step out of your comfort zone and test your limits by introducing yourself to the world of Via Ferrata. Your guide will begin your day with an introduction to the equipment, before heading up into the mountains along a 1.4 km route and reaching a height of 2300 metres above sea level. Too soon, your wonderful week in the Canadian Rockies is over – to be re-lived in memory over many years. Fresh Tracks Canada customer service support – from the time you book, you will be assigned your own personal Vacation Coordinator with whom you can reach out to with any questions or requests. Guided Rock Climbing Experience is available until the September 8, 2019 eastbound departure date. Guided walk in Sunshine Village is available from the June 19 to September 11, 2019 eastbound departure dates. Via Ferrata tour in Banff is available until the August 28th on the eastbound departure. Privately Guided Nature Walk: Operates from May 15 to Oct 15. Weather conditions may cause cancellation or unfavourable trail conditions on early and late season departures. Icefields Parkway Helicopter Tour: Flights are weather dependent and will not depart when conditions are too windy or too cold. Afternoon Athabasca Ice Walk Tour: Tour might be cancelled in case of thunderstorm and incremental weather conditions out of their control. Scenic Ride to Sunshine Village & Hosted Trail Walk: Activity is available from end of June to end of August. Dates may vary due to weather conditions as the snow conditions will play a factor in opening times. This trip is available for departures between June and September. based on double occupancy, June 2019 departure and our base class.